The yard is an important part of the home; it's the place to relax, to enjoy your vacation time and to watch your children play safely. But it's not always easy to find the time to make your yard as incredible as you might like. If you live in Ashland Massachusetts, Patrocinio's Landscaping are just what you've been looking for for your landscaping needs. Cleiton Patrocinio wanted to start a business that would allow him to provide citizens of Framingham MA with his talents and training in pruning, planting, irrigation and design, and in 2000 he established his landscaping business. Essentially, Cleiton works in commercial maintenance, specializing in Plowing as well as Construction. For twelve years, Cleiton has worked for commercial and private clients landscaping the grounds of businesses as well as private homes. Cleiton offers landscaping design and landscape construction, such as lawn mowing, tree trimming, planting flowers, trees and shrubs which includes unique shrubbery and sculpture-work. He can construct rock gardens, as well as fish ponds to your specifications and can place pavements, yard furniture and the installation of outdoor lighting. Throughout the Spring, he can bring areas back to life following winter snow, whilst in the Fall Cleiton can remove leaves, and in the winter he offers a snow plowing service, including the removal of commercial snow. Nevertheless, providing excellent work isn't Cleiton's only love and passion in life. In his spare time, he likes nothing more than volunteering at the local Children's Choir, providing the kids with direction and helping to serve the community by funding the local Church. 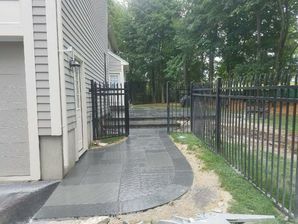 If you live in the Ashland Massachusetts area, take full advantage of Cleiton's skill, passion and ability in landscaping and lawn care, and give him a call now on: (508) 669-7959 for a chat, a quote or for more information about what Clean Slate Landscape & Property Management, LLC can offer you and your lawn. Call any time, days, evenings and weekends, to discuss your Ashland landscaping needs.